U19 Ukrainian League. Matchday 30. May 29. Shchaslyve. Knyazha Arena. 23 oC. In the final meeting of the season, the teams did not face any competitive issues. Shakhtar secured the third spot, with Dnipro staying adrift of the Pitmen after suffering four consecutive defeats. In the first half of the season, the opponents produced one of the most exciting performances in the entire league season, which ended with a strong-willed victory for Donetsk (2-3). In today's match, the Orange-Blacks were left without their captain Oleksandr Pikhalyonok and the main right-back Volodymyr Grachov, who were replaced with Andriy Zaporoshchenko and Illya Putrya. With Andriy Bubentsov taking up the place between the sticks. The opening stages were played by teams very cautiously, with a lot of individual challenges in midfield and few dangerous moments. The Pitmen were more successful in that positional battle, converting their chance on 24 minutes. Dmytro Topalov dashed to the edge of the penalty area, for Oleksandr Hlahola to send it home – 1-0. The goal noticeably revived the game. 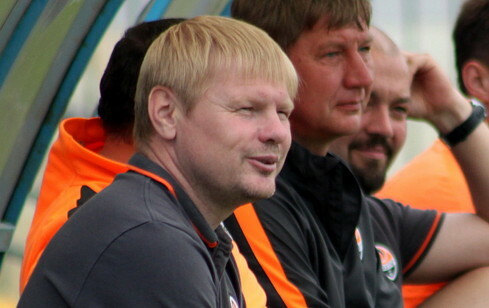 Bugai, Hlahola, and later Avagimyan could double the lead of Shakhtar. In response, Dnipro midfielder Nazarene hit the post. Immediately Avagimyan, Bugai and Topalov orchestrated a beautiful move crossing it into the penalty area, with a Hlahola effort being denied by the away goalkeeper. However, the Pitmen did not leave for the break without the second goal scored. On 43 minutes, the Orange-Blacks played a corner from the right. Vladyslav Bugai boldly raced along the goalline and fired a powerful shot from point-blank range, with the keeper clearing it, and Shakhtar striker tipping the ball into the back of the net – 2-0. After the break, Shakhtar dropped deeper, allowing the visitors to have more control of the ball, at the same time hoping to catch the opponents on the counterattack. However, Dnipro quite quickly took advantage of the situation: on 51 minutes, Kamil Khuchbarov reduced the gap to make it 2-1. The Pitmen did not depart from the chosen tactics and orchestrated a few dangerous moves.Oleksiy Zinkevych ran one-on-one, with his shot hitting the goalkeeper, and Oleksandr Hlahola’s close-range effort was blocked by defenders. On the opposite side of the field, Andriy Bubentsov was busy. Especially impressive was the double save by the goalkeeper following a Dnipro free-kick. Closer to the final whistle, it was a real battle of nerves with a large number of grave violations and collisions. The referee put out the emotion with yellow cards, showing a total of nine yellow cards. Obviously, the away side had more strength and motivation for the match ending. On 85 minutes, Svyatoslav Shapovalov took advantage of the confusion in Shakhtar’s penalty area and rescued Dnipro from being defeated. 2-2 – a combative draw between Shakhtar and Dnipro in the last match of the season. The charges of Serhiy Kovalyov andGennadiy Orbu finished in the third spot in the U19 Ukrainian league table, staying behind Dynamo and Olimpik. In 30 matches fo the season, the Pitmen claimed 19 wins, gaining 62 points. At the same, the Donetsk team scored 67 goals and conceded 30. Now the players will have a month of vacation. The new season kicks off approximately at the beginning of August. - To win games, you have to be motivated from the first to the last minute. Otherwise, it is very difficult to claim a victory. In today's match we lacked, perhaps, individual skill, teamwork, concentration from the first second to the last one. All this has led to such a result. Although the opponents had a good level, we fought throughout the match. Therefore the draw is a natural result. For various reasons, we had a few players missing, but all the same we expect more and demanded more from the boys. On the whole, I am happy with the ending of the season. For some reason we failed to win the league title. But there is some progress, and it will be if the players really strive for it. Thank you guys for the season, which was very difficult. We all worked together tirelessly. Something worked, something didn’t, but in any case, both the players and coaching staff got some experience. There is still a lot of work to do. Success comes with tenacity. - I wanted to finish the final match on a positive note, to leave for vacation in a good mood. Unfortunately, we didn’t fulfil the competition objectives... As for the performance, we probably were too relaxed in the second half and lost the advantage. We thought that we would park the bus, not attack and retain the winning result, but we were wrong. We did not expect the opponents to put that much pressure, they didn’t even allow us to play the ball in front of our goal. In general, I think that I had a good second half of the season, being often fielded within Shakhtar U19, but in the recent matches we were fatigued, it was not easy physically. In the future, I would like to progress and secure a place in the reserve team.